It is important that you dog have positive experiences of the muzzle from the outset – as you can imagine, dog aren’t going to like having a muzzle put on, and all too often, muzzling becomes a fight every time the dog goes out. To avoid this situation, the muzzle should be introduced gradually, and introduced with something nice. The type of muzzle I recommend is a greyhound muzzle. This muzzle allows dogs to breathe easily, and to pant and drink if they need to. It also has the advantage of having a “basket” type structure, with holes in it, which is ideal for “posting” treats, allowing you to still reward your dog for appropriate behaviour when he or she is wearing it. To get your dog used to wearing a muzzle, put a piece of your dog’s favourite food in the bottom of the muzzle, and bring it up to the dog’s nose. He or she will smell the food in the muzzle, and put their nose into it themselves. Do this for at least 20 minutes before attempting to place the muzzle on the dog, or until the dog is happy going into the muzzle and not backing away. Gently slide the muzzle over the dog’s nose, so he/she can get the treat, and then remove it again. Keep repeating this exercise, but on each occasion, leave the muzzle on for longer, so the dog gradually gets used to wearing it. Never take the muzzle off when the dog is struggling to take it off. 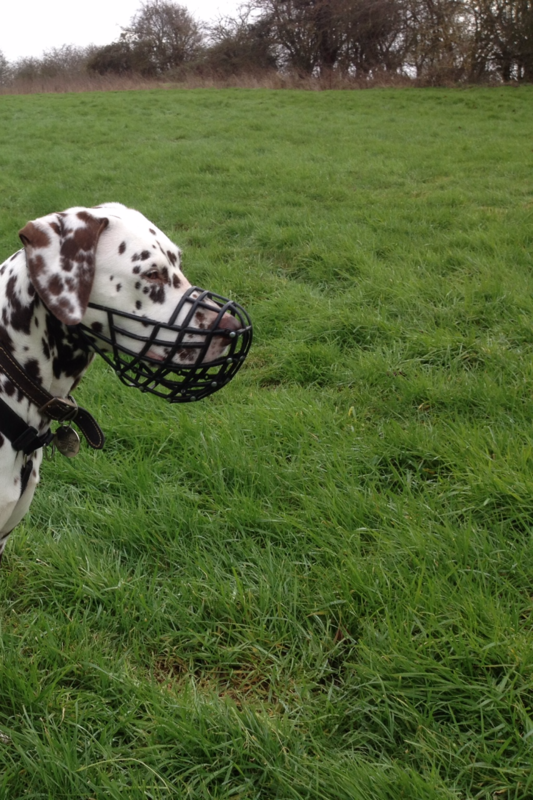 Try not to put the muzzle on at the same time or place everyday, or your dog could start to anticipate. Put the muzzle on, and take it off again at different times of the day, and in different location. If you dog is displaying signs of stress whilst wearing the muzzle, it is best to take your dog to places where the muzzle won’t be necessary. Muzzles are really only a short-term solution (although certain breeds, such as ex-racers, require them at all times), as they cover a main area of communication (the mouth). Always seek advice from a trained professional, if you are faced with using a muzzle, to work towards addressing any social issues, and gradually phasing out its use.